Sorting out a space for drum recording joins the obligatory chocolate Hob Nobs on the menu for this month's Studio SOS. 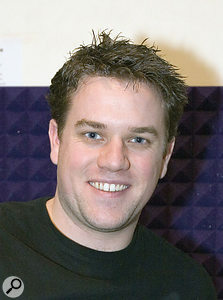 Darren Williams' main instrument is drums, though he also has a MIDI keyboard hooked up to his studio system. The studio is based around a Mac G5 running Logic Pro, and monitoring is done via a pair of KRK speakers. 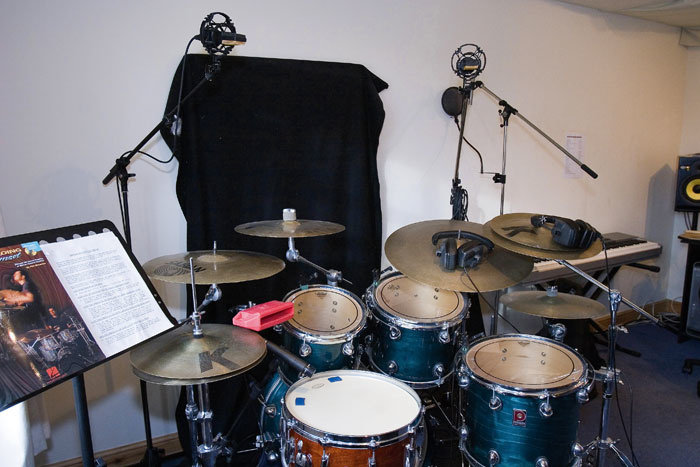 In addition to general recording, Darren also wanted to be able to record his acoustic drums to a high enough standard to allow him to operate as a remote session player, providing drum parts for clients via the Internet. Though he had a Roland V-Drum kit (TD8 with extra 12-inch snare pad), he feels that being able to offer 'real' acoustic drum sounds is important. 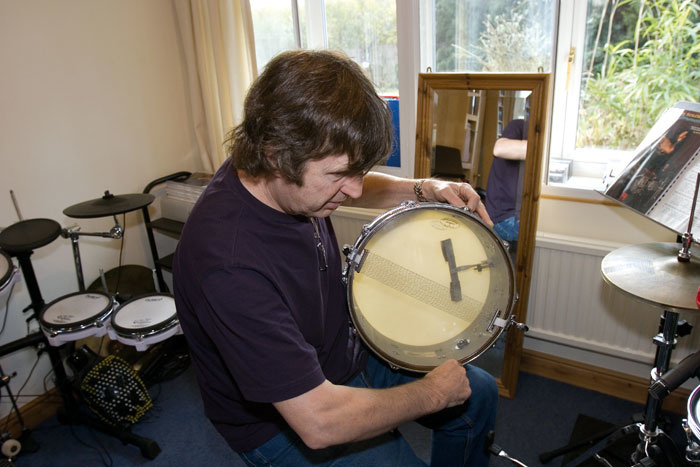 Darren was not getting the sound he wanted from his acoustic kit, and although he had a Roland V-Drum kit (TD8 with extra 12-inch snare pad), he felt that also being able to offer 'real' acoustic drum sounds was important.When we arrived, the studio was set up in a ground floor room which had little acoustic treatment. While we looked around, Darren provided us with fresh coffee and chilled chocolate Hob Nobs. There were a couple of blankets folded over large mirrors leaning against the wall (apparently Darren uses the mirrors to check for correct posture while drumming!) and he had fixed some thin fabric to wooden battens on the ceiling. When we took a closer look, however, it seemed that this fabric was some kind of canvas and it was virtually airtight (we tested this by trying to blow through it), which would prevent it from absorbing high frequencies effectively. We didn't have time to do anything about this on the day so we suggested Darren replace it using unbleached cotton dust sheets, ideally folded into pleats to increase the effective thickness. Slabs of 30mm (or thicker) cavity wall insulation rockwool could be fixed behind this over critical areas, to improve the absorption, and we suggested putting it over his mixing position and also over the drum kit to reduce the amount of ceiling reflections getting into his overhead mics. A simple way to fix this up would be to run nylon cord between nails fixed into the existing wooden battens and then push the rockwool in behind this. The fabric could then be fitted to hide these and to prevent any loose fibres from getting into the room. Before doing anything, we listened to some recent drum recordings made in the room, and we immediately identified a few problems. The kit itself wasn't sounding at its best, something easily fixed by fitting new heads and careful tuning, but there was also a noticeable amount of room acoustic on the recordings, giving the drums a rather constricted sound. Darren had also chosen some quite 'mushy' sounding reverbs, but he'd made a game attempt to polish up the sounds using gating, EQ and compression. The material used by Darren wasn't actually doing much to prevent unwanted reflections, so we placed Auralex foam above the overheads. This temporary solution made a big improvement, so we recommended that Darren implement a longer term solution using rockwool. One potential problem was that the drum kit was set up facing a wall, with very little space between the wall and kick drum. The overheads — a pair of AKG C414 TLIIs — were also clearly picking up reflections from the untreated walls and minimally treated ceiling, which were colouring the sound in an unhelpful way. The kick drum was lacking punch too, despite the use of an AKG D112, possibly due in part to mic placement, but the drum was also tuned too low for its size, robbing it of resonance and depth. Though the drums would benefit from new heads, Darren and I retuned the kit, which brought about some improvement. To temporarily dry up the room acoustic, we propped up three Auralex acoustic foam panels, one on each of the most reflective walls, and balanced a fourth above the overhead mics to reduce the level of reflections getting into these. This rested on the microphone shock mounts so the foam didn't touch the mics themselves. Great drums sounds often require great sounding rooms, but where such a room isn't available, the second best option is to remove as much of the room acoustic as possible and then add in something more appropriate using a convolution reverb. This is the approach we would take. We left the foam panels with Darren, so that he could fix them to perforated MDF sheets and then hang them on the walls, picture-style, using picture nails to avoid damaging the walls unnecessarily. In conjunction with the redesigned ceiling absorbers, and perhaps a couple of heavy rugs hung over other exposed sections of wall, we felt that this would dry the room up to an adequate degree. We also explained that if foam panels and rugs can be spaced a couple of inches from the wall, they will be far more effective than if they are fixed directly to the wall. Close mics around a drum kit aren't too much of a problem as regards coloration, as they receive far more direct sound than they do reflected sound. However, because overhead mics are much further away from the individual sound sources, they can pick up a lot of room ambience. 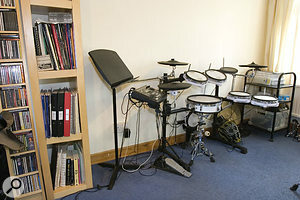 In a great-sounding room, this is what gives the kit its character, but in a domestic room it can be very counter-productive. As our plan was to dry up the overheads as much as possible, we decided to use acoustic foam to kill what reflections we could, and then look for a Space Designer room in Logic Pro that would create the impression that the drums were played in a much nicer-sounding space. We also moved the drum kit slightly so that it was facing a corner rather than a nearby flat wall, in case that was having a detrimental effect on the kick sound. 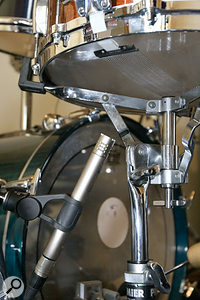 A boom stand was used to poke the D112 through a hole in the front head of the kick drum. The hole was a bit on the small side for easy positioning, but we eventually settled on a placement with the mic about halfway into the drum shell, and positioned mid-way between the centre of the drum and shell, so that it wasn't 'looking' directly at the beater. In conjunction with the retuning, this gave a punchier sound, with greater depth. We experimented with plug-ins to improve some of Darren's existing drum recordings — and, as it seemed to offer the greatest challenge, we started with the kick drum. 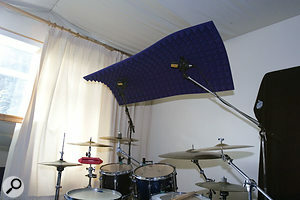 Darren had left plenty of headroom when recording, which is always sensible when recording transient sounds like drums. A compressor with an attack time of around 5ms added weight and punch to the sound, while we used EQ to take out subsonic frequencies, and to notch out a couple of 'knocky' overtones in the mid range. To add in the low-end punch, I tried Logic 's sub-bass generator which — if used in moderation — can really enhance the impression of depth, but once we had moved the kit and repositioned the kick drum mic, we found it unnecessary to use this. We used a harmonic exciter on Darren's recordings to compensate for a rather boxy snare sound. This suggested that we needed to capture more of the snare's 'snap'. After experimentation, we added Darren's AKG C451EB pencil condenser underneath the snare, which brought this out nicely.Turning our attention to the snare, we found that it sounded rather middly and boxy so, rather than using EQ to try to knock it into shape, we compressed it, as Darren had done, but we followed the compressor with Logic 's Exciter plug-in, set to a filter frequency of around 3.5kHz. 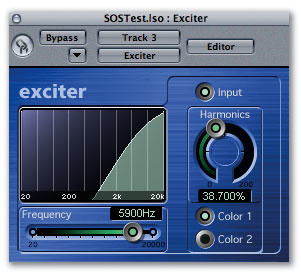 Exciter works by adding harmonics, rather than by EQ'ing what is already there, so we were able to add a very plausible crispness to the high end. There was little wrong with the tom miking, and Darren had used gates to clean up the tracks between tom hits; this is pretty much essential, due to the amount of booming that routinely goes on as the toms ring in sympathy with other drums in the kit, particularly the kick. As predicted, the overheads created the biggest problem, because you could clearly hear the coloration of the room. Rolling off a lot of low end on the overheads, so as to allow the close mics to contribute all the low-frequency elements, helped, but doing this kind of thing is really salvage work — and what we needed to do was find a way to let Darren get a workable drum sound at source. After moving the kit to face a corner, and using foam panels to kill the worst of the wall and ceiling reflections, we adjusted the overheads so that they were exactly the same distance from the snare drum (a jack lead was used as an impromptu tape measure! ), which would prevent the snare sound being coloured by phasing issues when the recording is replayed in mono. At this point, the foam panel we'd propped directly above the overheads seemed to bring about the biggest improvement. 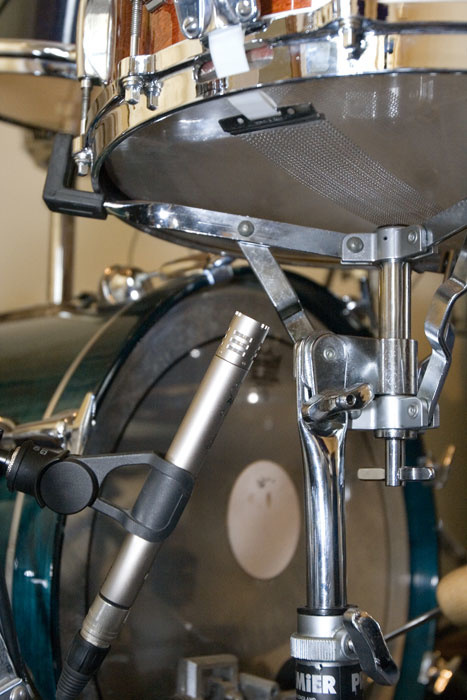 The tom mics were AKG's clip-on type, and were adjusted so that they were about two inches above the drum head, leaning in over the drum ring and angled down, so that they 'looked' somewhere between the drum centre and the drum rim. Darren had been using an SM57 as a snare mic, which we positioned similarly. A short test recording confirmed that the room coloration was now noticeably reduced, but we felt it would improve further once Darren had fixed the ceiling absorbers and covered them with a new, more porous material. If you can't blow easily through a fabric, sound isn't going to undergo frictional absorption when it hits it and any absorbing material behind the fabric will be less effective. No matter what you do to the room, it is important that your kit itself sounds good — new drum heads and careful tuning can make a world of difference!Since we had needed to use the Exciter plug-in to add some life to the snare sound, Hugh swapped the Shure SM57 snare mic for the AKG C451EB re-issue that Darren used for recording guitars. This is a small-diaphragm capacitor mic and we expected it to work well, provided the pad was switched in. Oddly, however, it produced a surprisingly bassy sound, with little attack or brightness. We then shifted this to the lower head, so that it would pick up the sound of the snares, and were rewarded by a much brighter sound that we thought might work well when added to the sound from the overhead mics. A further recording test confirmed that we were getting a much better sound from the snare drum using this revised arrangement but, to give him the most flexible options, we suggested that Darren could reinstate the SM57 on the top head and record both mics, in order that both their outputs could be balanced to give the best sound: a fairly common approach to snare drum recording. Following these changes, we found that we needed less EQ to get the kind of sound we were after and, though there were still some improvements to be made, these were now mainly due to the tuning of the kit itself, and less attributable to the mic positions or room acoustics. All that was left was to find some better reverbs, as the ones Darren had been using were rather too boomy for the type of music he was working on. He liked the idea of using one reverb for the snare and a different one for the rest of the kit, so we settled on a brighter, plate-type sound for the snare, courtesy of the 'Spitty Drums' impulse response in the Space Designer reverb library. 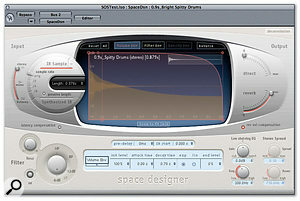 The graphic envelope adjustment was used to reduce the intensity of the reverb decay, and a heavy roll-off below 200Hz was added to thin out the reverb sound. For the toms and overheads, we used 'Bright Drums', again in Space Designer, and modified the envelope and low-end filtering so that the 1.7-second-decay tail was less obtrusive. What we achieved by using these new reverb settings, and by moderating the amount that we used, was the impression that the drums had been recorded in a real, and more flattering, live room. We also tried some overall compression on the stereo drum submix, to help glue the sound of the kit together, using a ratio of around 4:1 and around 5ms attack time, with a decay of one tenth of a second or less. Unless you have a great-sounding room (which is rare!) you're better off recording a dry-sounding kit and adding ambience during the mix with a convolution reverb. We wanted a bright plate sound for the snare, and chose the 'Spitty Drums' impulse response in Space Designer, using the graphic envelope to reduce the intensity of the reverb decay and a heavy roll-off below 200Hz to thin out the reverb sound.Darren hadn't appreciated that, by default, Logic doesn't apply plug-in delay compensation to its busses, so this has to be switched on (All) in the Audio preferences section of the program. If you don't do this, the drum mix will be delayed relative to the rest of the song by whatever processing time the plug-in introduces. Convolution reverbs such as Space Designer tend to introduce quite long delays. This, in turn, significantly increases the latency of the system, which can cause problems when overdubbing. Leaving the buss delay compensation switched off isn't a problem if, for example, you're using the busses simply as reverb returns, because any delay just adds to the reverb pre-delay — in fact, it may be best to avoid using the busses for recording and to leave the delay compensation switched off until you come to mix. By the time we had finished, the recordings we were making of the kit sounded a lot more like the kit itself than they had before, so any further big improvements would need to be brought about at source by selecting suitable heads and by careful tuning. Darren had been using a multi-band compressor on buss mixes, along with a limiter to achieve a bit more level and density. On the whole, he'd tackled this the right way, using low compression ratios and low thresholds. However, when supplying drum parts to clients, we suggested that it would be best not to apply any mastering processing, and that it may be wise to either provide the files as separate tracks for mixing or to do two or three different versions, with different amounts of reverb added. Of course, a viable alternative for creating great-sounding drum parts would be to use the V-Drums to trigger high-quality samples, such as those provided by FXpansion's BFD or Toontrack's DFH, but to use real mic'd-up cymbals (using a pair of overheads) rather than using the sampled ones. No matter how good sampled cymbals are, the limitations of most pad systems means they can't reproduce all the subtle nuances of the real thing, especially for hi-hats. I've used this technique myself on numerous occasions and it sounds really 'expensive'. As drummers aren't very tolerant of latency when monitoring, it is quite possible to use the V-Drums' own sound when playing (via headphones plugged into the V-Drum brain) and to add the desired amount of the backing track by feeding the DAW mix into the V-Drums' aux input. This saves setting up a bespoke monitoring system and works perfectly well in most cases. Using semi-open phones also allows the drummer to hear the real cymbals as well as the headphone monitor mix. Darren was very open to trying all the options we suggested, and seemed to keen to get on with revamping the room acoustics and tuning up his kit. He'd already got a pretty good grip on processing and knew to use gates before compressors for the most reliable triggering. Hopefully, once the room issues are fixed and the drum kit tuned to perfection, he'll be able to get exactly the results he's after without having to rely so heavily on processing to fix an imperfect source sound. "I was extremely excited when Paul and Hugh agreed to come over, as I was in a bit of a rut about how to get the best sound from my room — in the past I have had to record my drums at other studios, before sending them to clients, but I really wanted to do it all from one place. I had read a lot about room acoustics but had become confused about how to apply it to my situation, so I purposely left the room as bare as possible and waited to see what they would recommend. I've taken Paul and Hugh's advice and have now re-headed all my drums and tuned them to their most resonant pitches, but did feel they were appropriately tuned for the styles of music I play. I incorporated Paul and Hugh's advice about re-covering the ceiling with a porous material. Placing rockwool above the kit and monitoring positions has made a massive improvement. In conjunction with the Auralex panels, which are now mounted on MDF, and the repositioning of the kit, the changes have enabled me to get the drum sound I was looking for — the room is now not colouring the overhead sounds as it was before. "Paul offered some invaluable advice regarding the reduction of certain frequencies to improve the sound of the bass drum and toms, which I have found particularly useful. His advice on reverb settings was also extremely helpful. "I'd like to thank Hugh and Paul for making the long trip to Hertfordshire, as I now can provide acoustic and electronic drum tracks at a high standard: I only wish they could have stayed longer!"